As we settle nicely into the dog days of summer, a bit of adventure calls us to the coast where castles stand proud and little ones make-believe within their ancient stone walls. Queen for a day is our motto and the girls pretend to rule over their kingdom of mermaids and garden fairies. Untamed summer play goes hand in hand with the stunningly simple, hand-tailored garments from Tortoise & the Hare. The white linen Jane dress is a staple for summer. 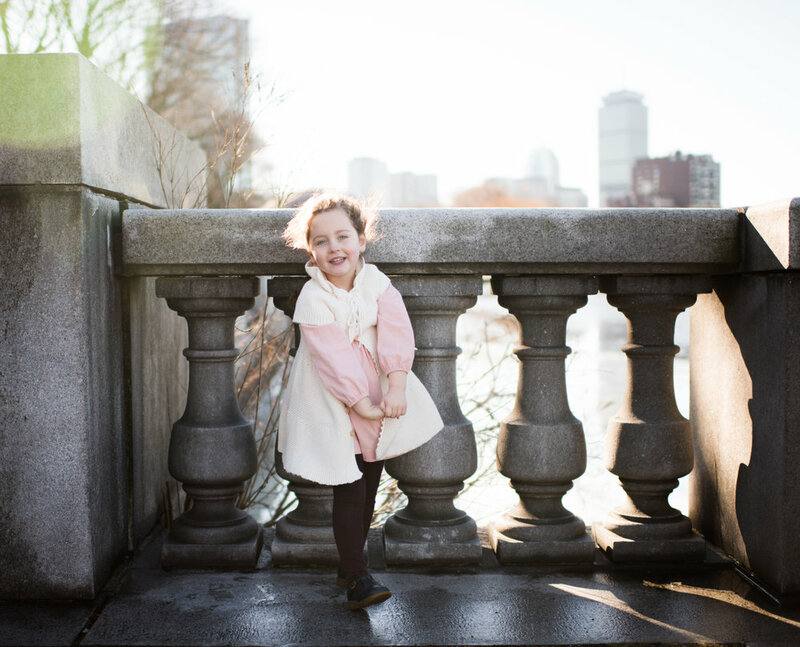 Its linen fabric is just as magical as our castle play and with a natural defense against dirt and stains, the Jane dress looks as beautiful as the day it arrived. Here along the shore, where queens still reign, this piece moves in the breeze with ethereal fluidity. Mila follows the play of her older sister, uncovering rocks and peeping through fences. As our family jester, Mila's energy and folly are unmatched. Yet, she remains cool as a cucumber in her linen and hemp blend tank and bloomers. Make-believe kingdoms, real-life castles, and heavenly summer fabrics are what dreams are made of. A delightful brand, hailing from Lancaster County, Pensylvania, we are dazzled season after season with the heirloom quality of these artisan-produced pieces from Tortoise & the Hare. 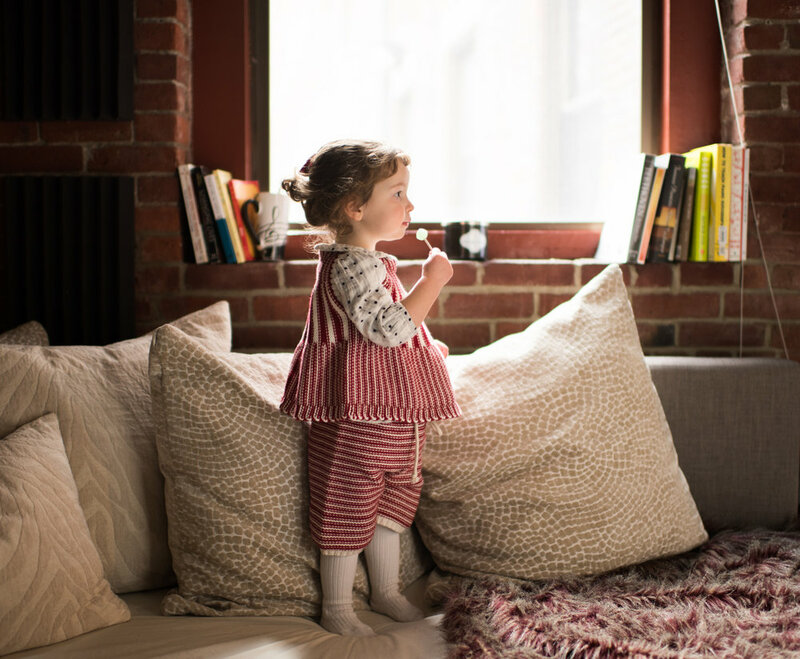 When the stars align and you've found the perfect knitwear to complement your little one's wardrobe, dressing for winter becomes a joy. 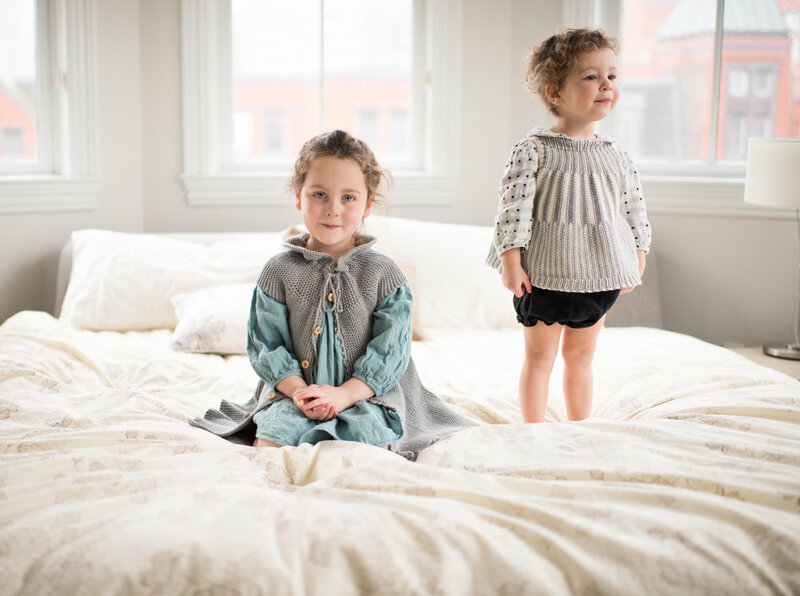 Such was the case for us upon discovering the beautiful range of baby and children's knitwear from Blue Alma. I welcome you to get to know this wonderful brand and the inspirational woman behind it! Owner and designer, Annemarie Shoemaker is dedicated to producing goods with a nod to tradition, the highest quality fibers, beautiful styling, and comfort. Annemarie's collection of knitwear provides the perfect amount of warmth without unnecessary bulk or itch. 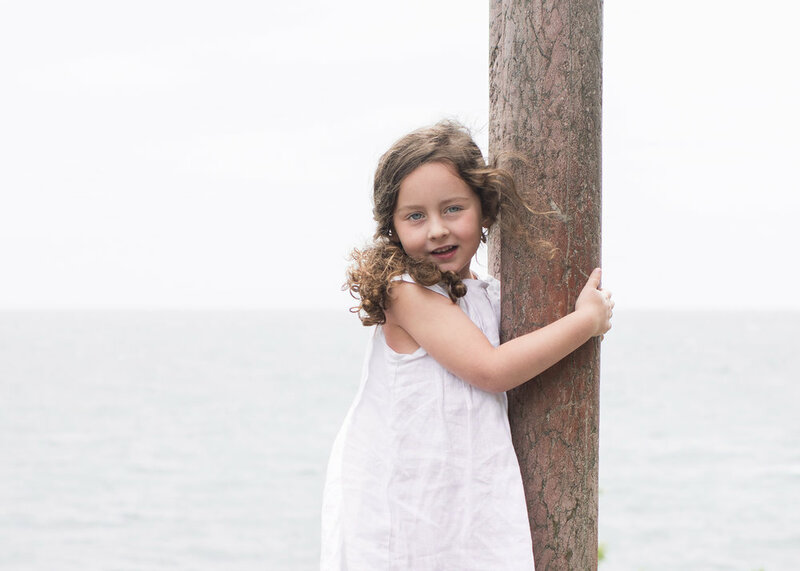 During her design process, a great deal of thought is given to a garment's functionality and the child's well-being without compromising on style. When worn, these pieces pull together any outfit effortlessly. Trust us, you'll be smitten. For Annemarie, knitting runs deep. A skill passed down through generations of family members, she pays homage to these traditions in each garment that is produced. After graduating from fashion design school in Berlin, Annemarie, a German native, worked in various settings as a freelance designer, in a yarn store, and as a technical design assistant for a knitwear company. Along the journey, true love eventually brought her overseas to live in Brooklyn, the birthplace of her handknit label, Blue Alma. Yarns are thoughtfully chosen and made from pure natural fibers. The current collection was produced using a cotton-alpaca blend, snuggly soft yet breathable with the ability to wear year-round. Annemarie was lucky to have found a team of talented artisans in Peru who help produce the knitwear while maintaining the brand's dedication to 'handmade.' These women and men are highly skilled and detail oriented knitters who deserve a fair wage. Feel good knowing that your Blue Alma purchase helps to support this collaboration of talent worlds away. People often ask me what there is to do in Vermont over the summer. Many know northern Vermont as a winter playground in the cooler months. After all, skiing is what brought my husband and I here years ago. Well, beyond the hiking, river swimming, craft beer tasting, and outdoor concerts, you can add blueberry picking to the list. This pick your own blueberry farm is only a short drive from downtown Stowe, accessed by a windy dirt road reminiscent of a fairytale forest. Speaking of fairytales, this red corduroy cape from Tortoise and the Hare seems as if it has jumped out of the pages of a favorite bedtime story. Not all reds are created equal and this one is divine. It is the same color as the barns here in Vermont, a wonderful muted red that pairs well with everything. If you're looking for the perfect transitional piece for Fall, this should be at the top of your list. The cape is lined with a soft bamboo fleece that is oh so cozy. I've said it before, and I'm sure I'll say it again, these pieces are cut to perfection. Oh Willaby how we love thee! After years of buying leggings in every color and length for Elise I was so excited to find a pair of summer pants that weren't skin tight and had the perfect amount of slouch. The cotton is airy and soft and looks incredible wash after wash. I adore everything this brand stands for and their commitment to high quality, ethically produced items. Check out their story here and swoon over their new fall pieces. Have any favorite blueberry recipes? Please let me know! These berries are in our freezer waiting to be eaten. The title of this post is actually the name of a wildflower guide I found on island last week which I'm still regretting not purchasing. Nantucket is a magical place in many regards and can attract a wide array of visitors as a result. I love that every time we visit, we uncover something new about the island. For the first time, this year Bartlett's Farm offered wildflower picking tours and it was a messy adventure but oh so worth it. The day before our flower tour, a special little package arrived from the coveted new label Tortoise & the Hare Clothing out of Lancaster County, PA. Rosina has designed a collection of the most precious heirloom quality pieces. We were thrilled to learn about this new brand and snag a few items from her first release. I think Elise has worn this gingham blouse three out of the last four days. The cut is superb and it wears beautifully. And wooden buttons up the back, need I say more? We happen to be a hat family. Much like those who collect sunglasses or other accessories, we like our hats. Elise was the first in our family to get a Peter Beaton followed by my husband and then finally I had to join the party and get one too. If you're ever on island, please visit this adorable hat studio, tucked away down an enchanting alleyway visiting the shop is an experience in itself! Elise enjoyed helping me arrange our wildflowers when we returned to the house. I'm keeping my fingers crossed Bartlett's Farm offers this tour again next year!